Summer may be winding down but some people are looking into mission trips for next year. I'm always happy to share about my last adventure and encourage others to venture forth. The mission trip I went on Alaska taught me skills that would otherwise have never hit my radar screen. 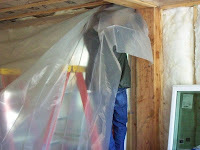 Who would have imagined that I would learn about vapor proof barriers, flooring or how to install insulation? Here we are with the vapor barrier. When we journeyed to Alaska, our mission trip team went to help build a parsonage. Preventing vapor intrusion meant having to install huge sheets of heavy plastic. The parsonage we worked on. Foreign or domestic mission trips open doorways into new languages and gives the participant an expanded view of the world. Because you are deeply immersed in a culture, this type of travel can be addictive and life changing. Our mission trip included some free time at the end of the day, the first day and on the last day. We took time to visit Talkeetna, Hatcher Pass and pick up supplies in Wasilla and a couple of other places. Our fearless mission trip leader arranged for our team to take a bus ride through Denali National Park at the end of the trip. The thick verdant forest protects both predators and prey. From the safety of the bus, we witnessed a wolf pack make a kill and watched a mother grizzly playing with her cub. Vast and remote, the vistas will be forever etched into my memory. It was the perfect ending for the last days that our team was together. Since my daughter and I drove to Alaska for the mission trip we had a car at our disposal. Hubby was picked up at the airport with the rest of the team and made the drive back home with us. Having a car made it possible to visit Fairbanks, Seward and parts of Anchorage that we missed by getting lost. We were able to see Prince Rupert, Canada and the isolated Cassiar Highway on the way back home. Learning about these towns and cultures would not have been possible without the mission trip. Sometimes the mission trip was frustrating. We survived a major car repair that threatened to end the trip, a small rock slide in Montana, a 5.7 earthquake, forest fire in Canada, problems finding a hotel (and then a campground). I would not have traded the Alaska mission trip experience for anything. It truly was the experience of a lifetime.